Named after the exact location in Siberia where Escoda sources its Kolinsky-Tajmyr Sable, Reserva Series Brushes are crafted using only the tail hairs from the male Kolinsky — renowned for their springiness and capacity to retain liquids. 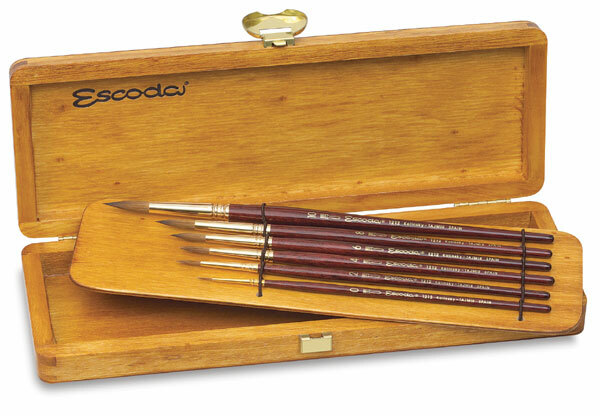 Selection of fine materials, as well as Escoda's unique "curing" process, results in a watercolor brush that many artists consider to be perhaps the finest in the world. Following a 75-year tradition, these exceptional brushes are crafted by hand to offer the finest points and sharpest edges available. Each is produced with a perfectly balanced, lacquered wood handle and a nickel-plated ferrule. 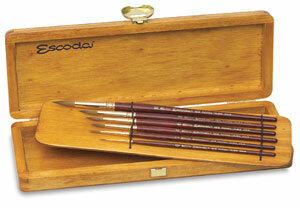 Series 1214 — Pop this clever little Escoda travel brush into a pocket or plein air box. It's ready for the road at a moment's notice! Hidden within its golden chamber resides a regular length, pure Escoda Kolinsky-Tajmyr Kolinsky Sable Pointed Round brush. Reserva Kolinsky-Tajmyr Sable Set — Six-piece Series 1212 set, ideal for the watercolor painter, includes round brushes in sizes 0, 2, 4, 6, 8, 10, with a gold-plated ferrule, and the finest Kolinsky sable hair available.